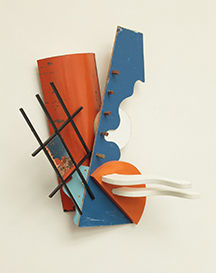 Provincetown, MA: The Alden Gallery will present “Mike Wright and Paul Kelly: New Work,” a two-person show, on Friday, July 11, 2014, from 7 to 9 p.m., at the gallery’s exhibit space at 423 Commercial St. Drinks and refreshments will be served at the reception, and the artists will be attending; the gallery is open to the public and free. The exhibit will be on view through July 24. Some time last year local artist Paul Kelly decided to paint landscapes from a different point of view—i.e., Google Maps. 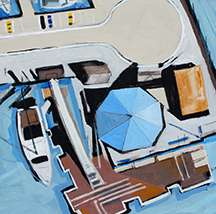 His new show at the Alden Gallery includes several works from this “Above It” series, as well other oils and drawings. Kelly studied architecture at the Rhode Island School of Design and fine arts at Syracuse University, and set up his studio in the very house and gardens where the legendary Henry Hensche once taught his students. Despite this historical setting, Kelly’s “preference for clean-edged shapes and a muted gold, ochre, gray and tan palette places his art apart from the jewel tones and loose brush strokes of what today is considered the Cape impressionist tradition,” writes Susan Rand Brown in the Provincetown Banner.